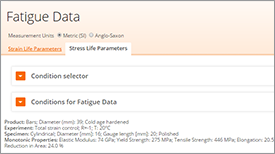 Complex-phase steels display high fatigue strength. 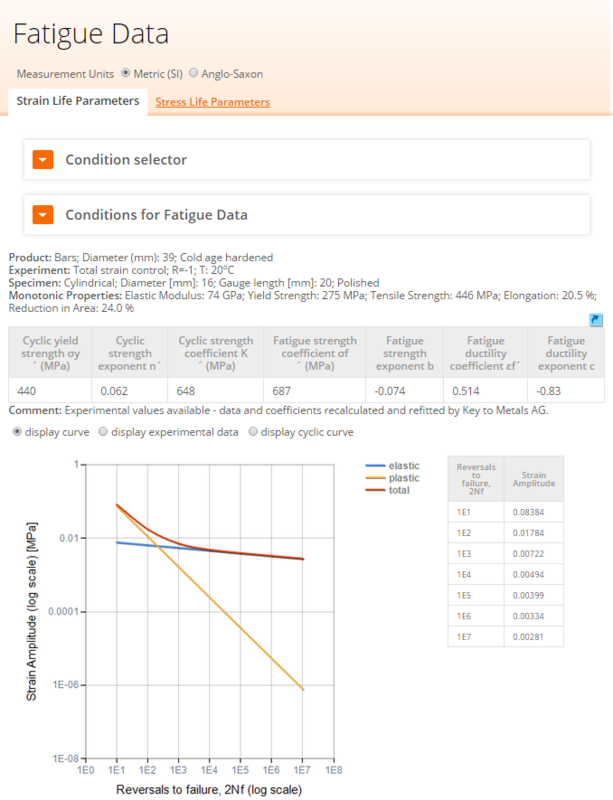 Based on stress-strain curves they display higher fatigue strength than dual-phase and retained austenite steels, but they are more sensitive to severe strain peaks, i.e. abusive loads. The structure of the steels is a ferrite/bainite matrix containing martensite and small amounts of retained austenite and/or perlite. This creates a high yield strength tensile strength ratio. The complex-phase (CP) steels belong to the group of AHSS grade, which gain their strength through extremely fine grain size and a microstructure containing bainite, martensitic, retained austenite and pearlite. These steel grades have been used for parts that require high energy-absorption capacity, such as bumpers and B-pillar reinforcements. 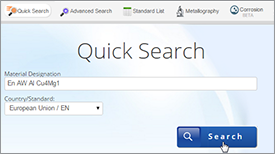 Complex – phase steels can be welded to other complex-phase steels and to other common steel grades. The welding parameters must be matched to the material. To spot-weld complex-phase steels the same equipment can generally be used as for unalloyed deep-drawing steels. Compared with lower-strength steel grades, complex-phase steels tend to have a lower electrical conductivity, which is why they require lower welding current with the same electrode force in spot welding. When resistance spot welding galvanises sheets, the welding currents must be raised due to the higher conductivity of the coating compared with the base metal. In addition, increasing the electrode force and welding time has a favorable effect on the welding current range. As well as sheet grade, surface and thickness ratio, other factors such as the type of electrode used play an important role in determining the optimum joining parameters. 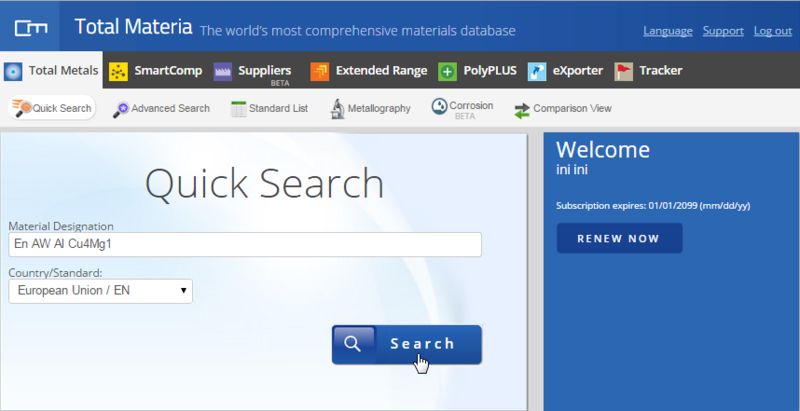 As an illustration of CP steel grades, please note some information about these materials produced by well known producers. Dogal CP (Complex Phase steels) are cold-rolled advanced high strength steels, which are hot-dip galvanized for corrosion protection. 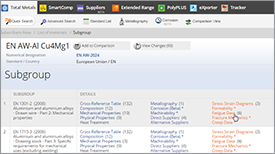 Dogal CP grades are multiphase steels. The structure of the steels is a ferrite/bainite matrix containing martensite and small amounts of retained austenite and/or perlite. This creates a high yield strength tensile strength ratio. Generally CP steels are easy to cold-form and excellent for stretch forming and roll forming. The steel grades are supplied in accordance with EN 10336. Also, ThyssenKrupp supplies two hot-rolled grades and one cold-rolled grade with strengths between 800 MPa and 1,000 MPa. Strip can be supplied in thicknesses between 0.8 and 3.0 mm and with two different coatings. 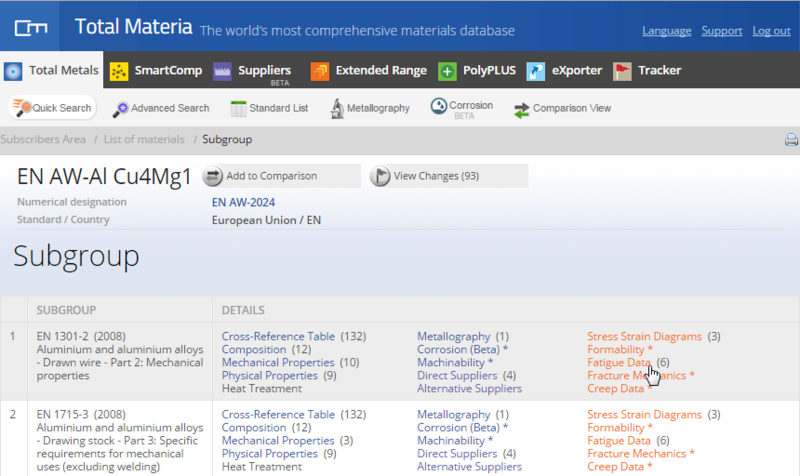 Tables 1, 2 and 3 give some common information about ThyssenKrupp steel grades. Complex Phase steels exhibit good fatigue properties and can be used in suspension system parts such as suspension arms. The figure below gives examples of Wöhler curves for a variety of Complex Phase steels produced by ArcellorMittal. 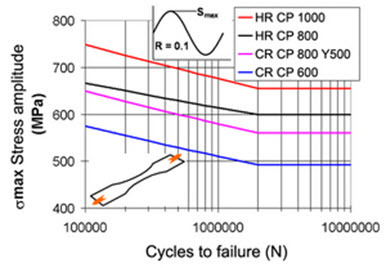 They are expressed as stress amplitude versus cycles to failure and are obtained with a stress ratio of R = 0.1 and repeated tensile loading. 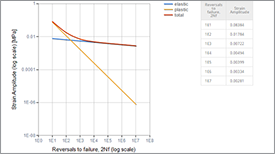 The graph below shows the low cycle or EN curves for the same steels. 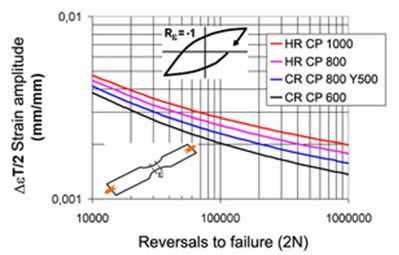 These are expressed as strain amplitude versus number of reversals (one cycle equals two reversals). 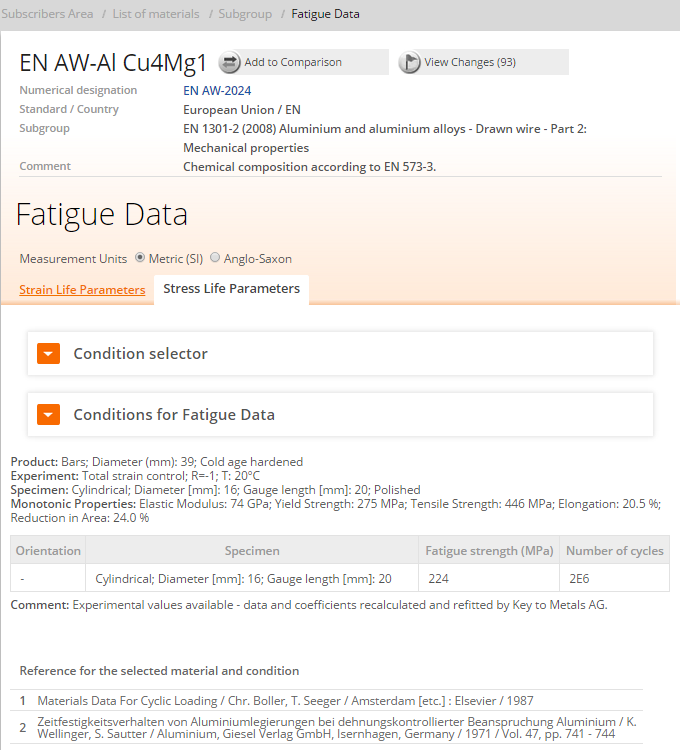 Other high and low cycle fatigue data are available on request.